DISCUSSION thread for BulgariaSat-1 mission. Successful launch on June 23, 2017 at 3:10pm EDT (1910 UTC) on Falcon 9 (reused booster 1029.2) from LC-39A at Cape Canaveral. Booster landed successfully on ASDS. PALO ALTO, Calif. – September 8, 2014 — Space Systems/Loral (SSL), a leading provider of commercial satellites, today announced that it was selected to provide a communications satellite for Bulgaria Sat, an affiliate of Bulsatcom, which is a leading telecommunications company and the largest provider of pay-TV services in Bulgaria. The satellite, which will provide Direct-to-Home (DTH) television service in the Balkan region, will be Bulgaria Sat’s first dedicated satellite. The satellite, BulgariaSat-1, will provide DTH services and fixed satellite services in the Balkans and other European regions to help meet the growing demand for telecommunications services. BulgariaSat-1 will be equipped with 2 Ku-band FSS transponders and 30 Ku-band BSS transponders for fixed satellite services and advanced television services such as high definition television. SSL assisted Bulgaria Sat in obtaining all of the financing for the satellite, including export credit financing from the Export-Import Bank of the United States. BulgariaSat-1 will be delivered in-orbit, following its launch on a SpaceX Falcon 9 rocket in 2016. BulgariaSat-1 is based on the space-proven SSL 1300 satellite platform that provides the flexibility for a broad range of applications and technology advances. It is designed to deliver service for 15 years or more. Not bad SpaceX - they have just landed another comsat launch contract! As its name suggests, this one is from Bulgaria and is built on Loral's LS-1300 bus - the same one used for the 2 satellites of AsiaSat. I surmise that if ArianeSpace has reduced its prices enough to compete with SpaceX in the light satellite category, their profits must be very slim to nonexistent. Either that or they're supplying some sort of deal sweetener, like low-interest financing. They launch two at a time and probably charge more for the heavier one. If they do that it will come back to haunt them as soon as FH flies. But it seems they claim they have suddenly found means to launch cheaper. Well, as a Bulgarian who has been following this forum for almost a year now, it is a suitable thread for a first on-topic post Congrats to Bulsatcom for thier first satelite.. and of course to SpaceX for grabbing this launch. Just wait for F9's reusable first stage.. if we are looking at launches for 20-ish mil. usd, then I have no idea how ArianeSpace and similar will compete in this class launches. Do we know the value of the contracts for SpaceX's BulgariaSat and AS's new ones? Good to hear the Bulgarians will have an own satellite. I would assume that the BulgariaSat contract was for SpaceX's publicized price 61.2M base + services. BulgariaSat-1 #satellite has begun thermal vacuum testing, which simulates the harsh conditions of #space. Sounds like this should still be ready for launch by the end of the year, will be interesting to see when it actually does launch. Two years after Bulsatcom started production of the first Bulgarian geostationary communications satellite, the company has only one test away from full technological readiness of the facility for launch into space. The full technical readiness of the satellite for launch into space, there is only phase for testing antennas in a facility called Compact Antenna Test Range (CATR). Once finalized vibration test, BulgariaSat-1 has been fully tested to be sure that continued to function normally and its components remain completely unharmed. Manufacture of satellites was awarded the leading company in this field - Space Systems / Loral (SSL), based in Silicon Valley in the US. 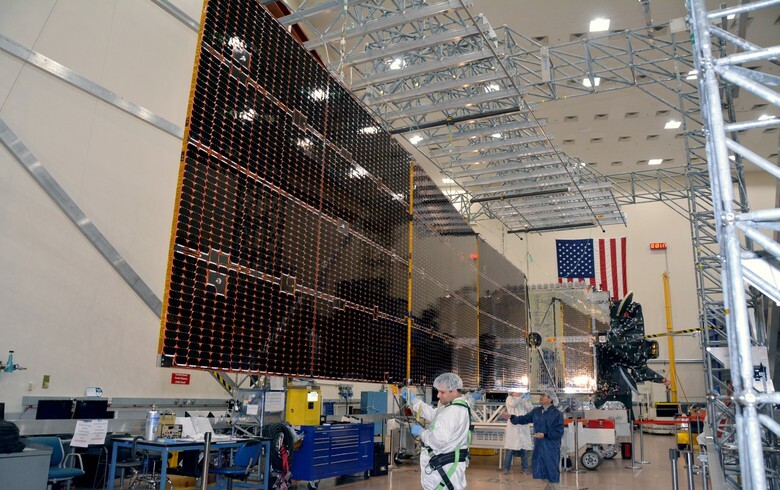 BulgariaSat-1 is scheduled to be launched by the end of 2016 through the launch vehicle Falcon 9 company SpaceX. The launch of the Bulgarian satellite will be carried out by NASA and will be broadcast live from Cape Canaveral, Florida, USA. Huh? Has NASA anything to do with the launch? I thought the launch provider is SpaceX and the Range is Air Force. Is this Bulgarian for "It's launched by Americans."? As gongora said when he posted the excerpt: "Yes, the last sentence is partially wrong, but the rest of it is probably useful." Bulgaria Sat CEO: We can handle a 6-month delay at SpaceX (was scheduled late 2016, now unknowable). Beyond 6 months, customers may leave. SOFIA (Bulgaria), April 21 (SeeNews) - Bulgarian telecommunications company Bulsatcom said on Friday its geostationary communications satellite, BulgariaSat-1 - the country's first - has successfully completed all major assembly and test procedures at Space Systems/Loral (SSL) in Palo Alto, California. Before preparations for shipment began, SSL and Bulgaria Sat technicians performed several final checks on BulgariaSat-1, including a test designed to simulate the satellite’s solar array deployments in the zero-gravity environment of space, final integration and test of the satellite’s reflectors, and other important tests to ensure that the satellite will perform nominally during its design life, according to the statement. At the launch base in Cape Canaveral, Florida the satellite will be integrated into a SpaceX's Falcon 9 rocket which will take it into orbit. BulgariaSat-1 will be positioned into orbit at 36,000 km above the Earth, providing television and communication services covering the Balkans and other European regions. Within 30 days of the launch, the satellite will be operationally ready to broadcast a large number of high quality TV programmes to end-users. Bulsatcom is a leading telecommunications company and the largest pay-TV services provider in Bulgaria. Any chance this launches mid-June? There seems to be an opportunity from LC39A between CRS-11 (May 31) and Intelsat 35e (late June), or would we already know about it? Any chance this launces mid-June? There seems to be an opportunity from LC39A between CRS-11 (May 31) and Intelsat 35e (late June), or would we already know about it? According to http://www.launchphotography.com/Delta_4_Atlas_5_Falcon_9_Launch_Viewing.html, Ben Cooper states that following SpaceX CRS-11, BulgariaSat 1 is the next to launch before Intelsat 35e. Specifically, Iridium booster 1029 that flew from Vandenberg in January. It's amazing that BulgariaSat was inspired by the success of SES-10 to reuse one of the Falcon 9 boosters. BulgariaSat was persuaded by SpaceX to use a reused booster even before SES-10 was launched. By using a reused booster, they jump to the front of the launch queue! Reusability does indeed increase availability and provide much flexibility schedulewise, which is one of the benefits the Air Force looking at. How exciting to see another step to normalizing reuse.